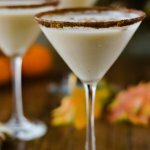 The flavors of pumpkin pie in a martini glass! If you’ve ever wondered what Fall tastes like, well, this is truly it, my friends. Sipping on this Pumpkin Spice Martini makes for a warm and cozy evening around the fire with friends. What a cozy drink to make your “happy hour’ even happier. Everything pumpkin is what you’re gonna find here: Bailey’s Pumpkin Spice, Pumpkin Spice Syrup and Ground Pumpkin Spice. Sounds like a lot of pumpkin spice? Yep! But believe me, when mixed with the vodka, it truly has a smooth (but boozy) taste of Autumn. 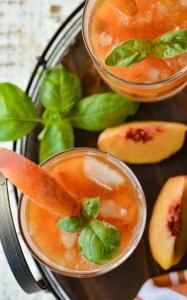 Like most cocktails, you can mix it together and serve it within minutes. All you need is some vodka, Bailey’s Pumpkin Pie Spice (YUM!) and some Pumpkin Spice Syrup (like Monin). It is literally, pour, shake and serve. And you’ve just become the life of the party! The flavors combined together really do remind me of a piece of pumpkin pie. You would think with all this “pumpkin spice” going on, it would be too much. But just the opposite. It has a layering effect that is distinctly pumpkin in every way. The sugared rim is mixed with (you got it) pumpkin pie spice. 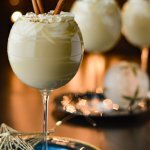 So from the moment, your lips touch this martini glass until you enjoy the last sip, you are indulging in a “spiced up” cocktail that is Fall in every way! 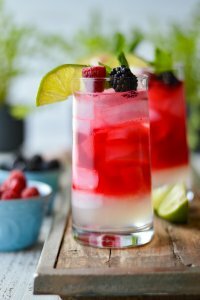 The sugared rim is the beginning of this enticing cocktail. I wasn’t able to find my pumpkin pie spice from the spice rack so I created my own. Very simple – cinnamon, nutmeg, ginger, and cloves combined it with sugar. Voila, the start of a beautiful friendship with a delectable drink. 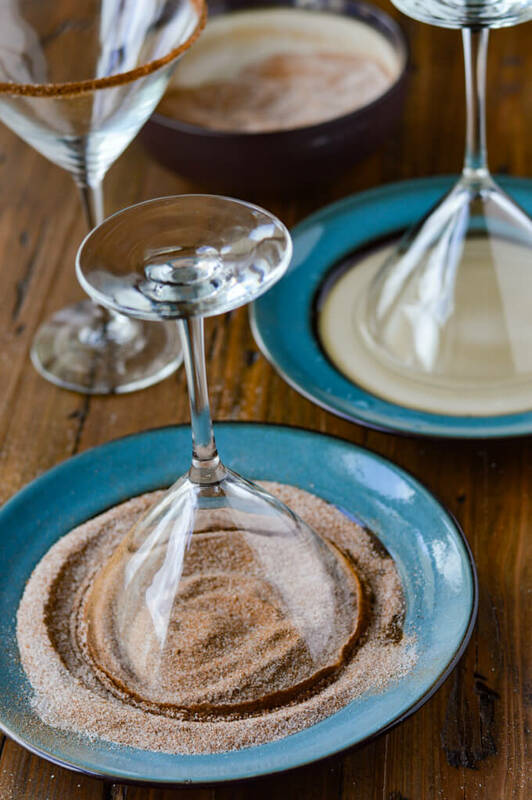 Use a shallow large saucer (big enough for the whole martini rim) with about 1/4 inch of water, another shallow saucer with about a 1/4-inch of the pumpkin pie spiced sugar. Then, let the dipping commence. Use a martini glass because it has a large rim for expanding and enjoying all of that sugar! It is a step you don’t want to leave out. The combination of the rim plus the cocktail itself is a match made in heaven. In the meantime, put these martini glasses in the freezer to get a nice frost on them when you pour in the cocktail. Start with a shake! Pour all the ingredients in a cocktail shaker. Why a cocktail shaker? 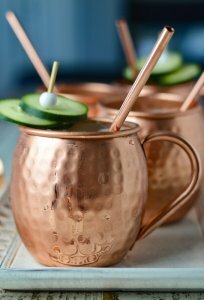 It’s all about mixology and it’s a necessity if you’re gonna be a self-proclaimed home bartender. A Cobbler Shaker is my choice. 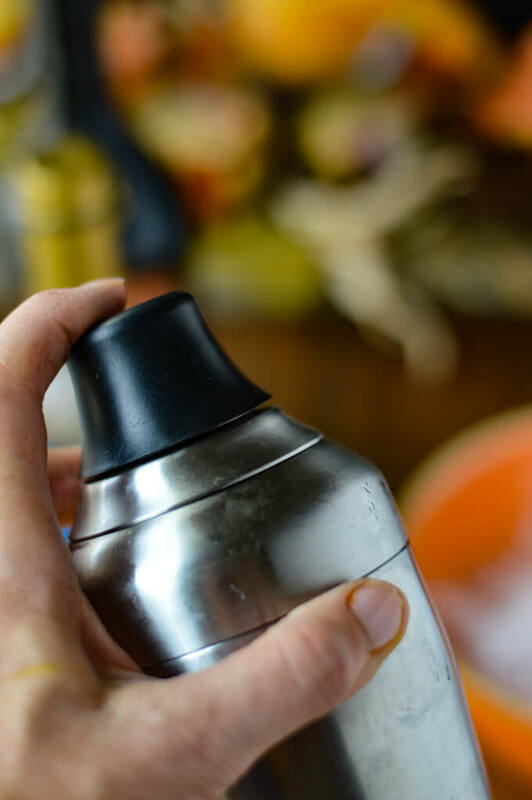 It is a three-piece stainless steel shaker that consists of the tin, a lid with a built-in strainer, and a lid that can double as a liquor measurer. Why shake? The cocktails should be blended vigorously and emerge from the shaker cool and crisp (with tiny ice particles floating on top of the martini). If you want to look like an authentic bartender, hold both ends of the shaker, and shake wholeheartedly over your shoulder for a long counted 10 seconds or until the stainless steel becomes frosty. This is how your dazzle your friends. One of the delights of a martini is the ritual of sipping. But nothing is worse than a luke-warm cocktail that’s sat too long (ugh!) 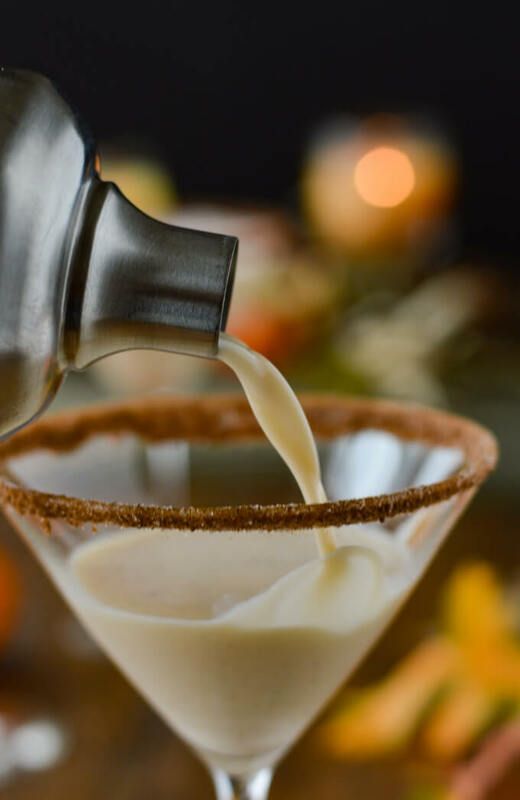 Therefore, you want this Pumpkin Spice Martini to stay chilled while you continue to sip. Enter the frosted glass straight from your freezer moment. Not only does this create a glass that is pretty and all, but it serves as a “chilling” function as well. 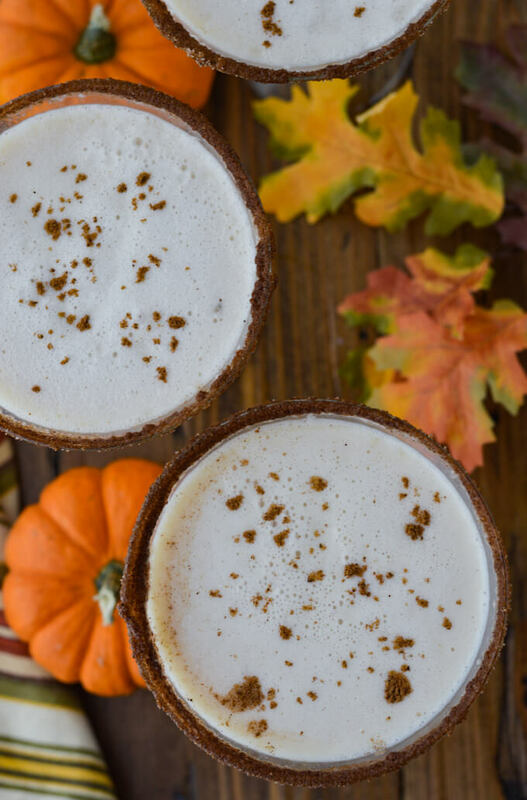 Pour the Spiced Pumpkin Martini into the glass and ENJOY! Pumpkin spice, vodka, Fall, sipping drinks and friends. What a combination for a relaxing, enjoyable evening! 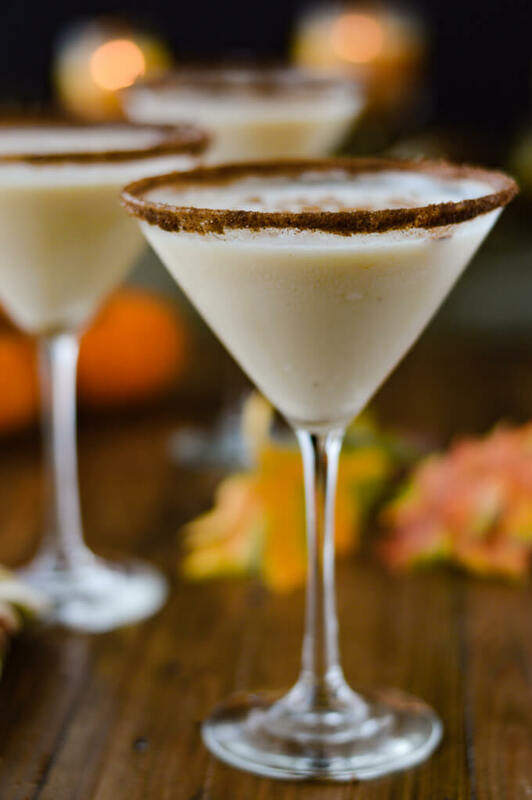 And I have the perfect drink in mind – yep, this Pumpkin Spice Martini. Enjoy!! 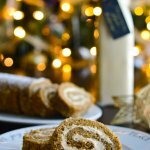 Salted Caramel Pumpkin Cake Roll. This is like drinking Pumpkin Pie in a martini glass but with a nice boozy kick. 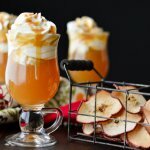 This cocktail has all your favorite Fall flavors. It’s time to sit and sip the evening away. 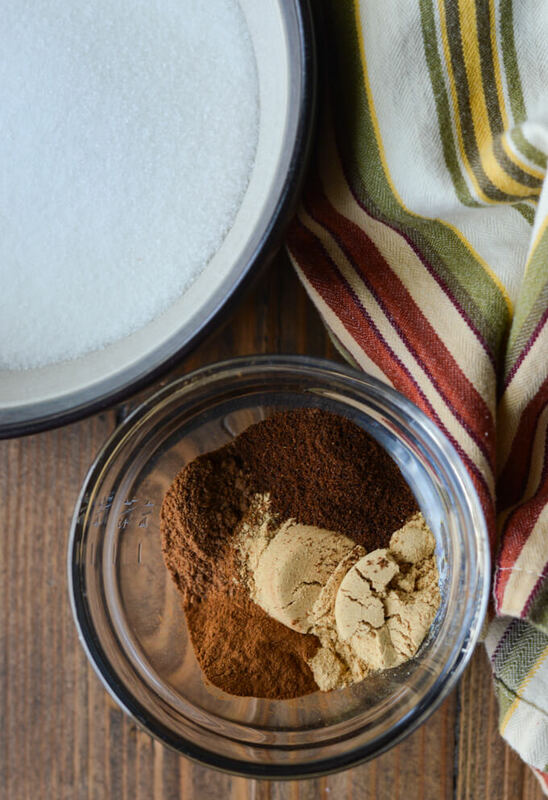 Mix together all the ingredients for the Spice Pumpkin Sugar for the rim. Pour 1/4 cup of cold water in a saucer large enough dip a martini glass. Add the Spice Pumpkin Sugar mixture to another large saucer. Turn the martini glass upside down and dip the rim into the water. Shake excess water off. Add all the wet ingredients for the cocktail into a cocktail shaker along with the pumpkin spice. Add crushed ice. Shake Vigorously. Pour into spiced sugared rim martini glasses. Sprinkle some ground nutmeg on top (optional). 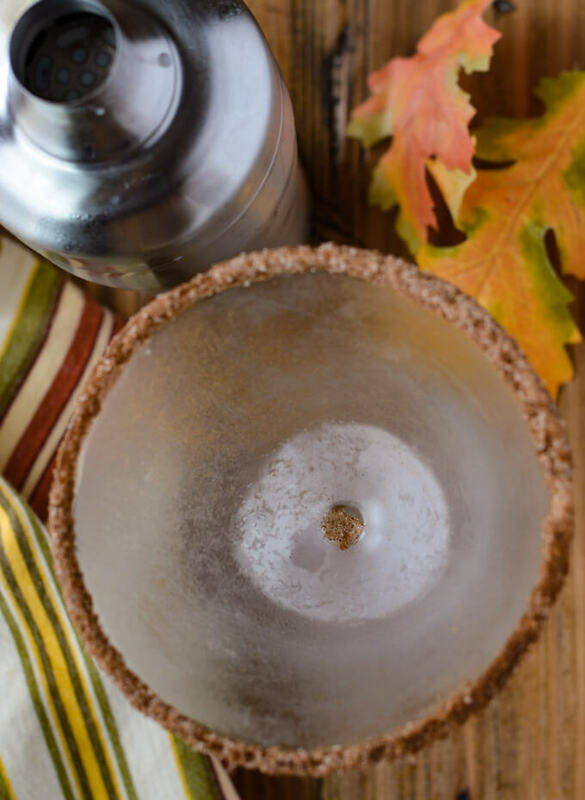 Use a shallow large saucer (big enough for the whole martini rim) with about 1/4 inch of water, another shallow saucer with about a 1/4-inch of the pumpkin pie spiced sugar. The cocktails should be blended vigorously and emerge from the shaker cool and crisp (with tiny ice particles floating on top of the martini). Use a frosted glass straight from your freezer. Not only does this create a glass that is pretty and all, but it serves as a “chilling” function as well. Fresh Nutmeg makes anything better! The Bailey Pumpkin Pie Spice sounds crazy good for this recipe. This looks fabulous. 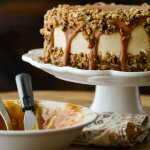 Is pumpkin spice syrup something you buy where coffee syrups are sold? I was tempted to buy Bailey’s pumpkin spice last week – now I must get some! Can’t wait to try this. Thanks Mimi. And yes, the pumpkin spice syrup is a coffee syrup. Thanks, I need to put that in the post. And actually, I’m looking at my bottle and it is pumpkin “pie” syrup not “spice.” I’m gonna update that info. Hope you enjoy your weekend! Freddie, you are so kind! Thanks for your sweet comment.